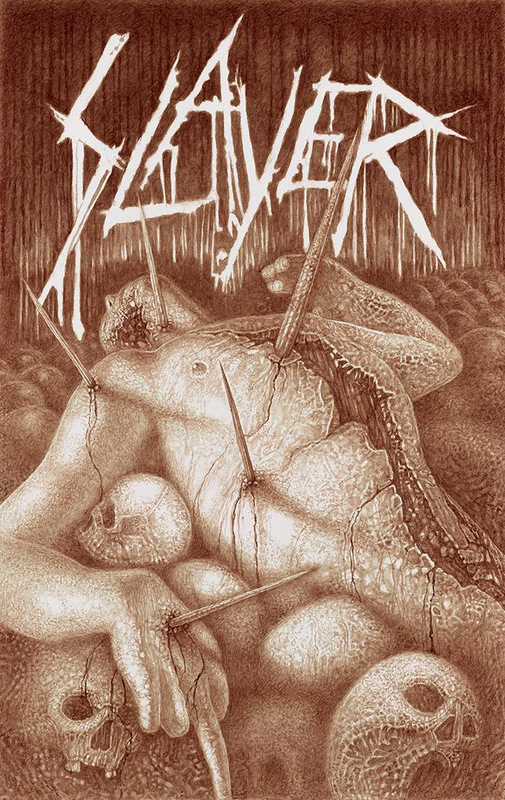 American Surrealist VINCENT CASTIGLIA, renowned for working with human blood, releases Slayer “Farewell” Tour Posters on Museum-Quality Giclée Prints on Somerset Velvet (100% Acid Free, Archival Cotton Rag, 255 GSM), produced on a Canon printer with pigmented archival inks. Giclée-quality are prints rated to not fade for at least 100-200 years. Each 16″x24″ poster is hand-signed and numbered and is priced at $150. The Slayer “Farewell” tour poster from New York’s Jones Beach on July 29, 2018 is limited to just 150 prints and will never be offered again. Don’t miss your chance to own a piece of art and music history! The poster may be purchased via Vincent Castiglia’s website at http://vincentcastiglia.com/product/farewell-official-slayer-farewell-tour-poster-jones-beach/. Vincent Castiglia practices a kind of modern-day phlebotomy, siphoning the life force which contains his own psychic energy, while giving it an outlet and form. In doing so, he dissolves the barrier between artist and art in a most literal and immediate sense. Castiglia’s figures, their musculature and skin, are painted with what could be thought of as “liquid flesh”. Its tendency to quicken the subjects is likely inapproachable by any other medium—as it is actual tissue with which it is being rendered. In this way, the subject’s realism is not merely an optical illusion due to its level of detail, but rather is an actual transference of flesh and blood to each work. Castiglia has been featured by the likes of The National Geographic Channel (NatGeo), Fox News, CNBC, BBC, New York 1 News, Fox News “Good Day New York”, The Discovery Channel, New York Post, The Huffington Post, International Business Times and countless other reputable television channels and publications. Castiglia has created cover art for well-known albums and films, painted pieces for entertainment legends such as Gregg Allman and Margaret Cho, and was even the first American artist to receive a solo exhibition invitation from Oscar Award-winning artist H.R. Giger in the history of the H. R. Giger Museum Gallery. Castiglia also made headlines after hand-painting Slayer/Exodus guitarist Gary Holt‘s signature ESP guitar with the Holt’s own blood. The guitar made its debut at the January 2016 NAMM Show in Anaheim, CA.